Compared to other industry firms, the ones in the CPG industry spend colossal amount of money on media buying and sales’ trade promotions. 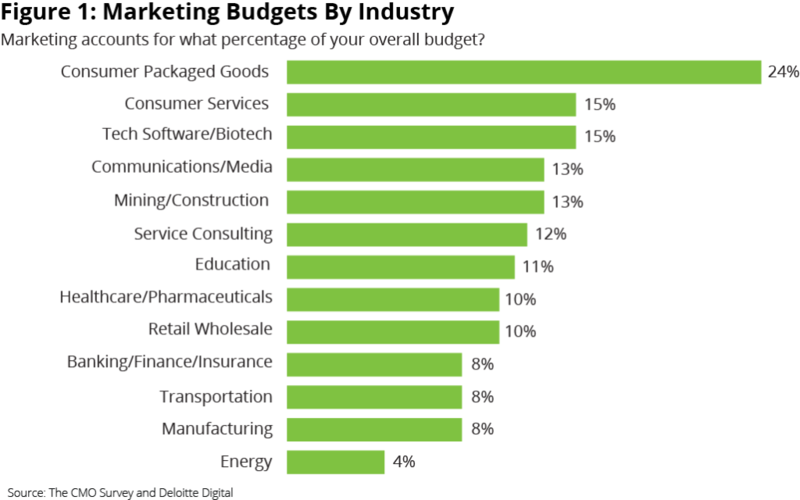 In fact, in a report by the The CMO Survey, it’s found that the CPG companies allocate the highest percentage of the total company budget to marketing. This is mainly because these campaigns have a major influence on the shopping and buying behaviours of consumers and thereby act as the primary drivers of revenue. Before the advent of digital media, CPG marketing was limited to traditional practices like print advertisements, TV commercials, Billboards etc. As the prominence of digital advertising increased, more and more CPG CMOs started shifting their focus to tapping the digital world. eMarketer predicts that by 2020, the total digital ad spending by the CPG and the consumer products industry in the US will reach close to 10 billion USD! Needless to say, the diversified marketing opportunities within the digital world are endless. As a result, decision makers face uncertainty over designing the highest RMOI-delivering campaign strategy. This uncertainty is reflected at all managerial hierarchical levels. A CMO might face uncertainty over dividing the annual investment between traditional and digital media, A country marketing head can be doubtful on whether to spend more on product A or product B etc. – you get the idea. The same story goes with sales teams which need to work in-line with marketing efforts. Based on the efficiency of supply chain, stock at inventory, current marketing campaigns, environmental, social and various other influencing factors, teams have to pan out the upcoming promotional activities and also forecast future sales. Since there are several things to consider and ton of data to go through before taking a single decision, employees take decisions based on gut-feeling, best guesses or partial intelligence from a stand-alone Business Intelligence or analytics tool. This lack of high accuracy in decision-making in both marketing and sales teams at all management levels results in a low/missed ROS and ROMI. Most CPG businesses already know the need for using data-driven analytics and in-depth insights for taking everyday key marketing and sales decisions. They are also investing in relevant tools. Gartner in its CMO spend survey confirms this fact. However, the adoption rates of most of these BI and analytics tools/softwares get reduced after a certain time and thereby become unsuccessful. There are 5 reasons for this debacle. The data fed in the system lacks quality. The software doesn’t provide actionable recommendations for the present and future. It’s too sophisticated to use and inconvenient to incorporate in day-to-day operations. These solutions are provided only for the high-level management. Most CPG analytics solutions don’t strike the perfect balance between providing in-depth insights and ease of use. Tools which give meaningful insights lack good usability and the ones which are convenient to use provide shallow insights. Marketing and sales teams as a result, abandon these tools and go back intuition-based decision making. Consequently, this leads to missed opportunities and low ROMI and ROS. Over the past several years, we empowered several CPG companies like Reckitt Benckiser, Coca-Cola, Unilever, Britvic etc. with intelligent BI solutions. In our journey, we discovered that incorporating the combination of Big Data and AI can drastically increase the efficiency of marketing and sales teams. This maximized efficiency also led to tangible gains in both top and bottom lines of these businesses. Here is the suite of BI solutions we used and the concept we followed for these Fortune 100 CPG companies. In most cases, the data obtained is based on what happened in the past (i.e 6-12 months ago). Since the consumer behaviour is fast-changing in the CPG industry, this type of data becomes irrelevant after a certain time. There are an umpteen number of important marketing and sales influencing factors in the CPG business and data from all these sources is imperative to maintain a high-quality big data. Also, thanks to the emergence of social media, a large amount of crucial unstructured data keeps piling up every second. Acuvate’s CPG suite takes real-time big data from virtually all consumer touch-points in the CPG business. The Big Data obtained can be classified into two types. Since the Big Data obtained covers real-time insights from all potential influencing factors, the marketing and sales analytics/reports obtained from this data will be of the highest accuracy possible. We will discuss more on this in the next section. Seasoned CPG executives within marketing and sales confess they don’t fully understand consumers’ digital behaviors or know the best ways to use digital channels and tools. What type of digital campaigns are trending etc. Point of Sales: Most CPG BI systems are provided with data solely from primary and secondary sales. But the root cause for the change in sales’ performance of a product or store or a department can be known only by getting insights on customers’ purchasing behaviours at the shop i.e at the Point of Sales. Weather: Weather is another major influencing factor for CPG marketing and sales. The demand of products changes seasonally. Since the demand fluctuates advertising campaigns and sales promotions have to be planned beforehand. Now that we took data from a myriad of influencing factors, it is time to convert them into meaningful and actionable insights. This is where most BI analytics solutions fail. Typically, a majority of CPG companies’ BI tools provide generic insights/reports from the data feeded to them. For instance, they can accurately project the annual sales trends in London for 2017, but can’t recommend you the necessary steps to be taken for improving sales. In simpler words, traditional BI tools can answer a simple “what’s happening” question but not a much-needed “why is it happening” or a “what’s the best way to proceed” question. Decision-makers need to go through a ton of reports and and process a large amount of data before arriving at a conclusion. In a fast-moving industry, this procedure is not humanly possible to follow daily and naturally executives move back to hunches, best guesses etc. AI technologies like machine learning algorithms, predictive and prescriptive analytics feed on high-quality big data from the above mentioned sources and granulate them into actionable insights wherever and whenever needed. These technologies help decision-makers bring in the much-needed data accuracy and can give the right forecasts and recommendations in crucial “what-if” scenarios. As previously noted, answers to key questions like “What’s happening”, “Why is it happening”, “What is the best way to proceed” can also be delivered. The whole process of decision-making would become hasslefree and data-driven at the same time. Choosing the best marketing strategy or sales promotions becomes a cake walk and the selected marketing/sales campaign will have the highest probability to deliver the maximum ROS/ROMI with a reduced spend. Machine learning algorithms can take in all this unstructured data dump and structurize them into meaningful intelligence. Am I spending at the right time and place? Am I missing any opportunity which can yield me good results? Is there a new segment that I can target? Am I getting the correct ROI for the marketing spend? Are my Marketing efforts helping competition and by how much? Can I optimize the spend on each brand based on the BCG Matrix? What should be my pricing strategy? What, where and how to promote? What is Must Stock List Qty for a region, channel, SKU etc. ? What would be the OTIF loss based on MSL non-compliance? What should be the right product mix at a store? These systems act as a promotions advisor to marketing and sales by recommending the right strategies to the right decision makers. Deploy AI Chatbots For a Quicker Data Access and BI democratization. High ROMI and ROS can only be realized when accurate decision making takes place at all management levels. Most CPG companies’ generally depend on the IT department for generating required reports/analytics. The access for these reports is given based on the priority of the request. Top-level management usually are given high-priority and the low-level management has to wait for their turn. Even if the BI software is a self-service one, it usually would be too sophisticated to use and time-consuming to generate required analytics. Usage of an AI chatbot can efficiently solve this problem. Powered with machine learning and Natural Language Processing, an AI chatbot extracts data from the existing BI system and presents the relevant analytics/reports/insights via chat. The chatbot cuts the dependency on the IT department and delivers insights directly to the chosen organizational messaging platform like Skype for Business, Skype, Slack, Telegram, SMS etc. With chatbots, BI will be democratized throughout the organization and anyone can get individualized insights instantaneously. Chatbots give the critical element of speed to decision-making. 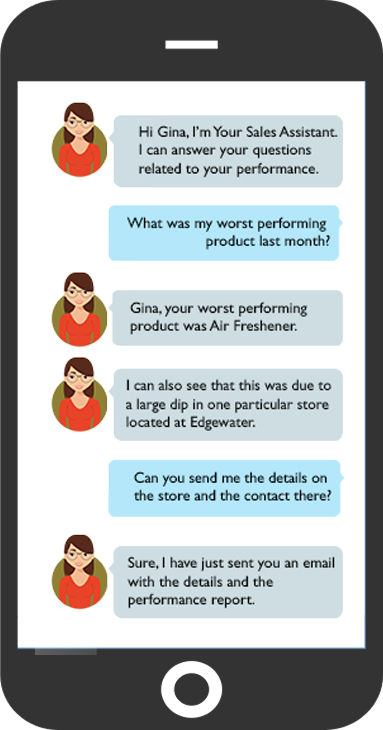 The conversational interface provided by chatbots allow marketing and sales to obtain the above-mentioned insights question after question. These virtual assistants eliminate the need to open the BI system over and over again. Sales teams, especially the ones on the field need speedy recommendations. By deploying an AI chatbot, these teams can just chat with the bot and get personalized data right within the actively used messaging app. Based on the user preference,the bot also presents data in all sorts of formats. Here is an example of our intelligent sales AI chatbot – SIA. AI bots can not only send information when asked but also initiate a conversation and send alerts to update the sales teams on key metrics like MSL compliance, missed KRAs, low stock news etc. In a nutshell, realizing high ROMI and ROS in the CPG industry depends on two factors – accuracy and speed. With the combination of high quality big data and AI technologies, these two factors are easily covered. The partnership between these two technologies in Business Intelligence brings in a chain of consistent accurate and speedy decision-making from the senior most level to junior most level management. A big data and AI powered BI system acts as an intelligent advisor to marketing and sales teams guiding them to craft the most cost-effective and high-ROI delivering campaigns and strategies.